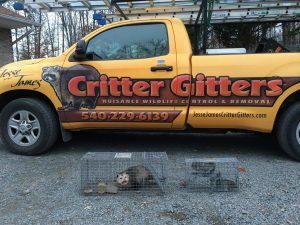 If you are in need of Emergency Snake Capture and Removal around Northern Virginia call now 540-229-6139. Snake removal in Northern Virginia is an extremely specialized job. Snakes tend to favor dark secluded areas when resting. Consequently we often find a snakes in houses under porches, snake in garage, snake under deck and snakes in pool house. Snakes also will go out in the open when hunting for prey or looking for a mate, this is when we find a snake on the driveway, snake on the porch or lastly a snake in the garden or a snake in the yard. Some species of snakes are more adaptable to live around humans than other snakes. A proper Nuisance wildlife inspection is key to determining your snake issue and coming to a solution. But all snakes will follow the food source and if the food source is near humans than the snakes will head towards people. That’s how we get snakes in houses. Then we perform a snake exclusion where we snake proof the house to keep snakes out. 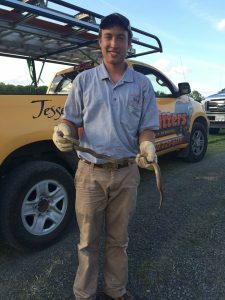 There are many species of snakes in houses that snake removal specialist deal with every day in battling snakes Northern Virginia. Some of the most common are the Black Rat Snake, Copperhead, Northern Water Snake, Garter Snake, Ring Neck Snake and Corn Snakes. These are all common Northern Virginia Snakes. Most are non-venomous snakes except for the Copperhead, which has a notable figure eight pattern on its back and is normally tannish brown. We also have Timber Rattles Snakes in the area but they are extremely rare to find around human civilizations. They keep mostly up in the mountains and national forests. People also call and say they have Water Moccasins (Cotton Mouths) in Northern Virginia; that is not true, there has never been a confirmed Water Moccasin north of the James River. It is a matter of biology the Water Moccasins in Northern Virginia cannot withstand the cold. Northern Water Snakes are mostly mistaken as Water Moccasins. Some species of snakes are more prevalent around homes than other. These are the snakes that most snake pest control company deal with. Our number one complaint and snake we catch around the house is the Black Rat Snake (Black Snake). They feed on frogs, toads, mice lizards and birds. It is very common to see a Black Snake eating birds out of a bird’s nest. Their food source is everywhere around houses so the black snakes have come very accustomed to people. The snakes getting into houses is second nature to them. Good thing is Black Snakes are non-venomous and non-aggressive. Still do not try to pick up a snake by hand, allow a trained Virginia snake removal professional to do it. Snakes are very important to our ecosystem and the mindless killing of all snakes is not good. If you hire somebody to help you with your snake control problem make sure they have the credentials to prove they are licensed and trained at controlling Virginia snakes. Make sure they are not simply a pest control company or snake exterminating company. We want to remove the snakes from your house, not remove them from the ecosystem. Hire a professional snake control company. Our business depends on your comments and reviews. Feel free to drop a comment on our facebook page.